It is obvious where we need to optimize, right? 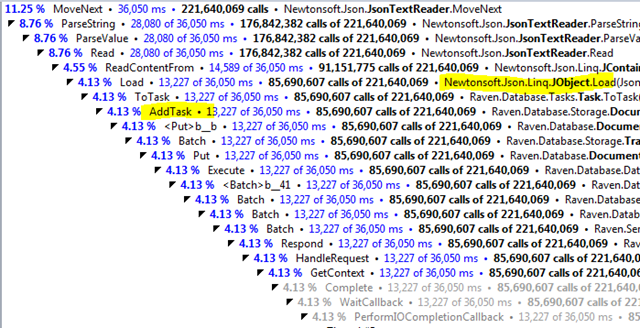 Except… each call here takes about 0.8 millisecond. Yes, we could probably optimize this further, but the question is, would it be worth it? Given a sub millisecond performance, and given that trying to implement a different serialization format would be expensive operation, I think that there just isn’t enough justification to do so. The Docs directory contains about 90,000 files, and there is no concurrent connection limit. Average processing time for each request when running in a single threaded mode was 100 – 200 ms. The problem was, at its root, an unbounded concurrency issue. Here is what happened. 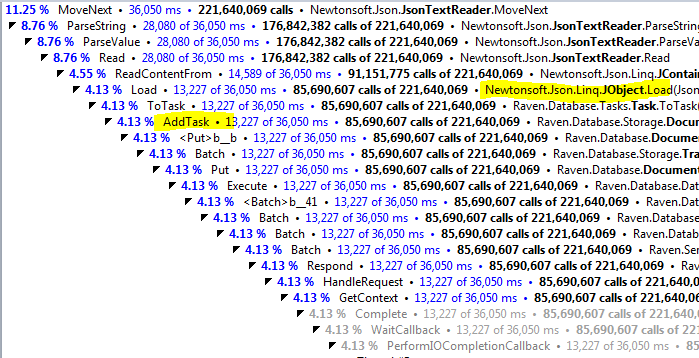 Handling a single request is pretty fast, but it is still going to block for about a 100 ms. The Parallel ForEach implementation is getting notified about the blocked thread, and in order to increase parallelism, it is going to spin another thread and give it the next task. That thread is going to block as well, and after a while, another thread will be created, etc. This code is big enough, and the response times are built just so to encourage the thread pool to create more and more threads. The server, at the same time, is having to deal with more and more work, causing request times to increase, which causes the client to create more threads, which causes the server to become more and more distressed, until eventually it fails and requests starts to error. The fun part is that if you reduce the load on the server, it would resume operating normally. But the errors that it gave in the meanwhile was… cryptic. There is a reason why most servers limit their concurrency level, there are always enough clients to saturate a server, and it is better to place a client on a request queue or send him “busy now, come back later” error than to crash because of resource allocation issues somewhere in the middle of processing a request. I have been doing a lot of heavy performance testing on Raven, and I run into a lot of very strange scenarios. I found a lot of interesting stuff (runaway cache causing OutOfMemoryException, unnecessary re-parsing, etc). But one thing that I wasn’t able to resolve was the concurrency issue. In particular, Raven would slow down and crash under load. I scoured the code, trying to figure out what was going on, but I couldn’t figure it out. It seemed that after several minutes of executing, request times would grow longer and longer, until finally the server would start raising errors on most requests. I am ashamed to say that it took me a while to figure out what was actually going on. Can you figure it out? That should be enough information to figure out what is going on. Why did the application crash? In order to test Raven behavior with a large amount of data, I needed to load a whole bunch of data to it. I choose StackOverflow Data Dump as my sample source. To JSON documents. Actually, it is a bit worse, the data dump is relational in nature, which isn’t really suitable for a doc db format. What I actually want is a User document, which contains badges in it and a Post document, which contains votes and comments in it. The theory was that I can reduce the number of calls to the database, thus reduce the overall cost. The problem is that trying to do this sort of merges in memory take a lot of time and a huge amount of memory. It is perhaps telling that I gave up that approach on a 64 bits machine with 8 GB of RAM. This is pretty simple, right? The fun part about the whole thing is now I am truly testing just Raven’s performance, because the client side is now just reading files and submitting requests to Raven. Another important factor is that instead of issuing a single request per document, we are able to batch them together in groups of 128 requests and submit them to /bulk_docs. Using this process, we see a pretty consistent average of about 1,000 documents per second for batched inserts and somewhat less than that for batched PATCH requests. Note that each file contains 128 requests, and that those aren’t final document size. User document is made up of the user data and badges, for example. But so far, I am pretty happy about it. After trying it out on NH Prof, profiler subscriptions are now opened for all the profilers. A profiler subscription allows you to pay a small monthly free (~16$) and get the full profiler capabilities along with the assurance of no upgrade cost when the next major version comes out. In addition to the monthly subscription, I got requests for a yearly subscription. I am not sure that I quite follow the logic, but I am not going to make it harder for people to give me money, so that is available as well for all profilers. Continuing my efforts to make RavenDB faster, I finally settled on loading all the users from Stack Overflow into Raven as a good small benchmark for Raven. This is important, because I want something big enough to give me meaningful stats, but small enough so I would have to wait too long for results. The users data from Stack Overflow is ~180,000 documents, but it loads in just a few minutes, so that is very useful. The AddTask takes a lot of time, mostly because it needs to update a Json field, so it needs to load it, update, and then save it back. In many cases, it is the same value that we keep parsing over & over again. I introduced a Json Cache, which could save the parsing cost. When introducing this, I was also able to make it useful in a few other places, which should hopefully improve performance in a few more places. Current speed, when inserting ~183,000 documents (over HTTP on the local host) in batches of 128 documents is 128 milliseconds. I consider this pretty good. Note that this is with indexing enabled, but not counting how long it takes for the background indexes to finish processing. When measuring that as well, after inserting hundreds of thousands of documents, it took another half a second (but note that my measuring granularity was 0.5 second) to finish updating the indexes on the background. I think it is time to try to throw the entire StackOverflow data dump at Raven and see how fast it can handle it. Can you figure out what the fatal flaw in this code is? Well, Raven is pretty much done now, from feature perspective, so now is the time to look at the performance numbers, see where I goofed up, etc. I decided to use StackOverflow Data Dump as my sample source (using the March 2010), because that is an accessible real world data, large, data set that I can utilize. I quickly wrote a simple ETL process to read the StackOverflow dump files and load them into Raven. I’ll speak about the ETL process in more detail in a future post, but for now, I want to talk about the numbers. As you can imagine, this means that we are asking the server to do a lot of duplicated work. It would be better if we would pre-prepare the values and insert them only once, instead of insert & then update them. Unfortunately, the data sizes are large enough that doing trying to do this in memory is too expensive. I can think of several approaches to try to optimize this, but at the end, I don’t really see a reason. This ETL process is probably how people will write it in the real world, so there is no point in trying too hard. In the end, using the March 2010 dump from stack overflow, I ended up with a Raven DB instance with: 2,329,607 documents. From random sampling, most documents are 1 KB – 5 KB in since, with several that are significantly larger than that. The database size is: 6.29 GB (out of which about 158 MB is for the default index). The first major issue was that I couldn’t tell how many documents I had in the database, get document count turned out to be an O(N) operation(! ), that was easy to fix, thankfully. The second major issue was that Raven didn’t really handle indexing of a lot of documents very well, it would index each document as a standalone operation. The problem is that there are additional costs for doing this (opening & closing the index for writing, mostly), which slow things down enormously. I fixed that by implementing index merging, so documents that were inserted at the same time would be index together (up to some limit that I am still playing at). With indexing disabled, inserting 2.3 million documents takes about 1 hour & 15 minutes. Considering that we made 4.6 million operations (including insert & updates), we are talking about over a 1000 operations per second (using single threaded mode). I am very happy with those results. With indexing enabled, and a single index defined, the process takes much longer. About 3 hours & 15 minutes, giving us about 400 operations per second (again, single threaded), or about 2.5 milliseconds per operation. Waiting for the background indexing task to complete took a lot longer, another 2 hours & 45 minutes. This gives me just over 200 documents indexed per second. I am pleased, but not really happy about those results. I think that we can do better, and I certainly intend to optimize things. But that is for later, right now I want to see how Raven behaves when it has that many documents. The results are very interesting. It is gratifying to see that browsing documents and retrieving documents is blazing fast, and once I fixed the O(N) issue on the stats, that is fast as hell as well. Querying the indexes is interesting. It is clear that Lucene doesn’t like to page deeply. On the other hand, I think that it is safe to say that we don’t really have to worry about this, since deep paging (going to page #4,000) is very unlikely, and we can take the half a second hit when it is happening. Querying index #2 is troublesome, though. It don’t think that it should take that long (without paging, if you want to page to page 80,000, please wait), even if that query returns ~2.1 million results. I think that this is because some of the Lucene options that we use, so I’ll have to look further into that. Nitpicker corner: Those are not the final numbers, we intend to improve upon them. My first day at work, and I am but a young whippersnapper. I arrived, did the usual meet & greet with everybody (and promptly forgot their names), then I was shown to a desk, given a laptop and one of my new coworkers rummaged in a desk drawer for a while before throwing me a document. Well, I say a document, what I mean is a book. It was couple hundred pages, and it was titled: Specs for the Ergaster module in the Heidelbergensis System. When asked what I was supposed to do with it, I was given a very simple answer: Implement. The document represented over a year and a half of work. The module was being developed for a client of our client. The module was meant to be both specific for the sub client needs and at the same time generic enough to used by other clients of our clients. The system that we were supposed to be a module in was currently under development and wasn’t in a position to be used by us. Well, I spent close to two years working on this project. I learned a lot, from how to proof myself from upstream teams to how not to design a system. I poured a whole lot of work and effort into this. Along the way, I also learned something very interesting about the spec. That was the first time that I actually had to reverse engineer a specification to understand what the customer actually wanted. Two years after we handed off the module to the client, I had the chance to go to lunch with the team leader from that client, so I asked him about the module. He informed me that they still haven’t deployed to production. I was depressed for a week afterward.